Chewy understands that you want the very best for your cat. That's why you'll only find the top brands for cat food, cat treats, cat toys and other cat supplies! 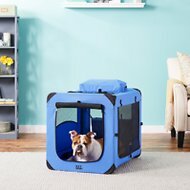 If you've been searching for blue cat crates, look no further. 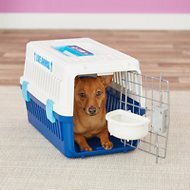 Among the wide selection we carry, one option to try is IRIS Pet Wire Dog Crate with Mesh Roof. 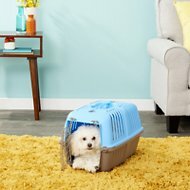 Key benefit: keep your pet contained in a fashionable, durable and secure pen they can claim as their own. 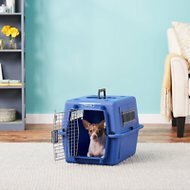 Another product is MidWest Spree Plastic Pet Carrier, Blue. Key benefit: easy-to-assemble carrier is made of durable, easy-to-clean plastic and includes a built-in carrying handle. Save yourself from hauling your cat litter and cat food home from the store, and get all the cat supplies you need delivered right to your front door with Chewy. 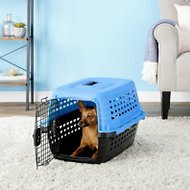 For all your pet needs including blue cat crates, Chewy has you covered! We're here for you.